If you have a breakdown in Kansas City or the surrounding area and need something welded we will come to you. Truck Trailer, Heavy Equipment, small or large jobs, at your job site or at your Business, Home or roadside breakdown. We repair handrails or we can build from scratch. 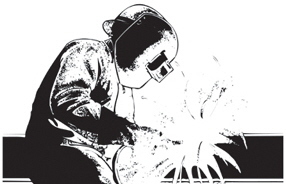 Mig, Tig, Ark or oxyacetylene welding. CNC Plasma cutting, Yard art size up to 4' X 8' parts 1/8" to 1" thick. If you have hard to cut shapes and have a rough drawing with all measurements, radius, & angles in most cases we can do it.